This week's Corner View theme is 'miniature worlds'. This timed perfectly with what arrived in my inbox yesterday - my sister was finally able to take some pictures of the projects I made for my niece (isn't she ADORABLE?!). Yes, it's March, but with a little one and all that goes with it, sending me pictures took time. This will be the second, and final, version of my Handmade Holidays 2009 (click here for the first one). This was my first year really trying to make so many handmade gifts, so I knew I needed a theme to get me going. I also had to pick items that would fit in suitcases and withstand hours of flying, baggage handlers, and our own roadtrip. I used the same three fabrics in each of the projects to help bring consistency to the room. This girl's room is our inspiration for my niece's nursery. Baby will graduate to a white bed when she outgrows her crib and my sister will continue working on the room herself. 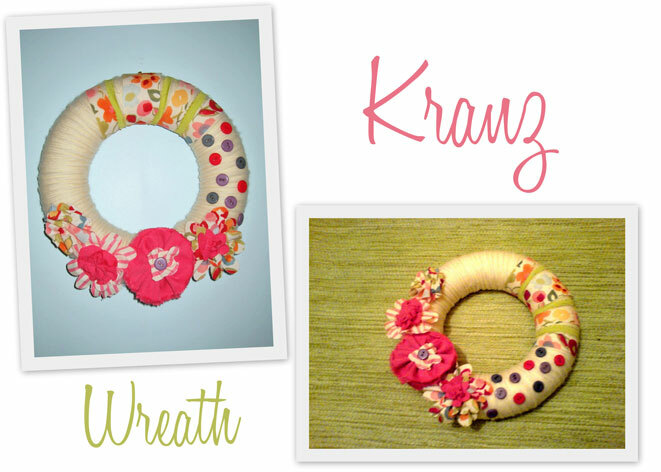 Of course, one of the things I made was a wreath; it was the year of the yarn wreaths after all! I used Heather Bailey's fabric flower tutorial and added them to a few flower silhouettes of my own for a layered look. A few sets of bunting were also added to the list. There are so many bunting tutorials online, I don't remember which one I used, but this one looks good. 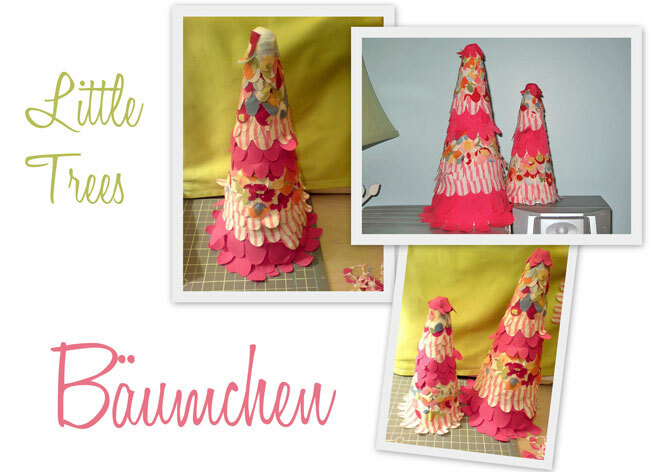 I found this tutorial on the fabric trees, so I gave that a whirl and was pretty pleased with the end result. I used straight pins to hold the fabric in place (this is also why they're on display out of baby's reach). Inspired by Tamar's gorgeous fairytale birdcages and dreamcatchers, I decided to see if I could do something like this myself. Knowing I had to pack everything flat, I had to hunt around the teeny tiny craft shop here in town and see if anything caught my eye. 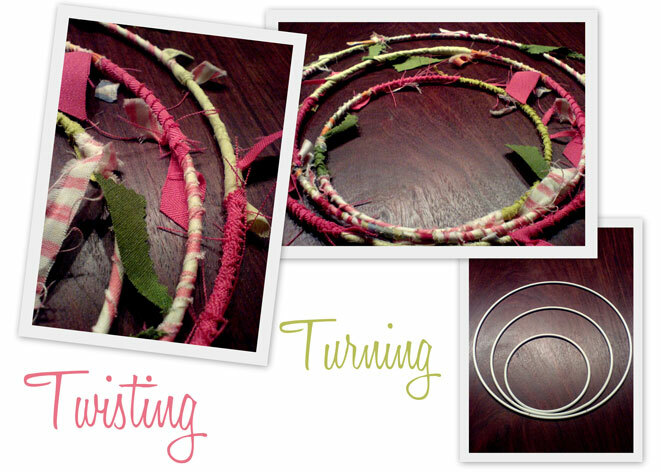 I found some white metal hoops (not sure what they're really for) and twisted and tied ribbon scraps from the previous projects to cover the hoops. I also added some extra ribbon I had lying around. 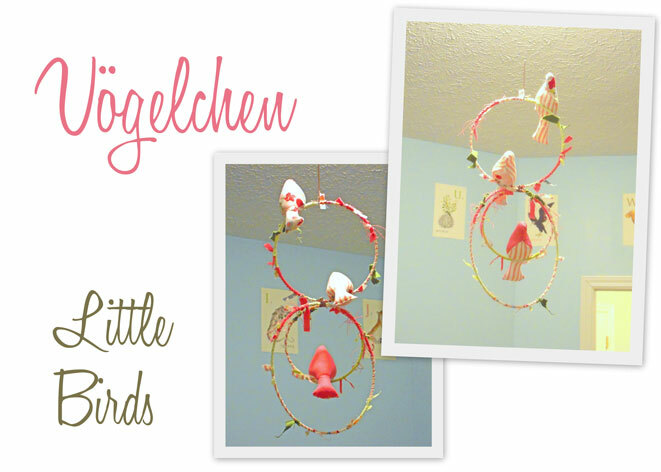 I used this pattern from Spool to make the little birds (it's also where I got the idea to mix my two ideas and make a 'fairytale mobile'). I waited until I got to the US to add stuffing. I had made lots of birds, so when I felt like I had enough on the mobile, I just added bells to the filling of the leftover birds to give my little niece some soft, little, jingly birds to play with. I'm happy to say she loves her jingly birds and looking at her mobile! My sister hung it from the finial of the ceiling light fixture, so it hangs down in the middle of the room. So that's it for the handmade things of Christmas past. My sister got her first sewing machine this Christmas, picked up her own copy of One Yard Wonders, and is already schooling me on project completions (of course). I've been banned from making the dining room table a sewing room, so I'll need to get my little office organized asap if I want to catch up with her (ahem, sibling rivalry?). My office has exploded with editing and sewing supplies. More on this later. For more corner views from around the world, head over to Spain Daily! hui i like the vögelchen mobile. i remember having a sewing pattern for those birdies... hmmm. could do this for our little sunshine as well. looks good juliette! GRRRRRRRRRREAT work Jules!!!! You did it! I've got loads of ideas for our baby's nursery but none like this. I just might have to borrow some of your ideas. Well done friend! Your niece is so cute! She's a doll! :) And those things you've made are beautiful! wow! everything is lovely! nice job:) happy weekend dear! I like the bird mobile a lot. The mix of different styles of fabric looks great! 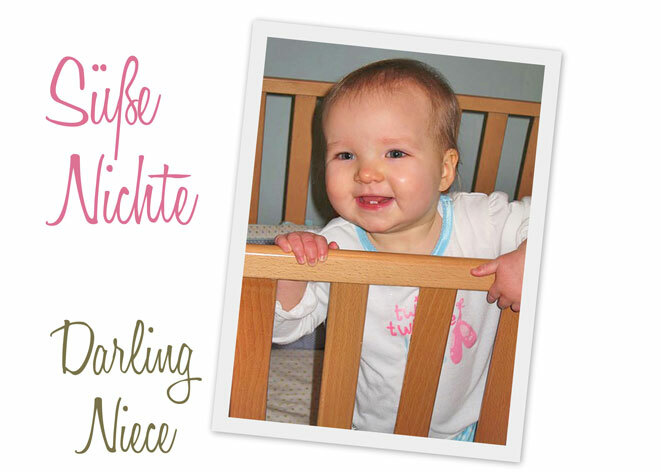 That is a very darling baby! That is all so freaking adorable!! And we just learned about adding -chen to everything little and baby related! The Bunting...I want one just for myself! And those wreaths... Sehr sehr suß! 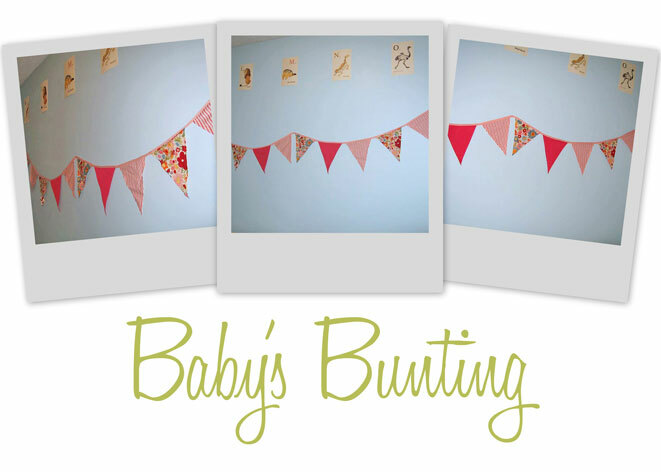 Even the word "bunting" sounds like the joy a baby brings to a family. These are truly cute pieces; I especially like that the pinks, limes, blues are set on a white background. 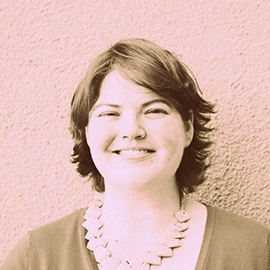 Too much pink or blues in a nursery has been overplayed. I agree with Jutta. We're not +1 yet, so the adult version is in our near future. I really love your layout of these photos! Did you do it in photoshop? This doesn't look like a standard blogspot feature! Your blog is a nice one.. very clean, easy to read, and great photos! You rock! Beautiful room set. I especially love the mobile - the concept could be adapted in so many ways for different children.